The Northwestern Hawaiian Islands are home to some of the largest assemblages of breeding seabirds in the United States. 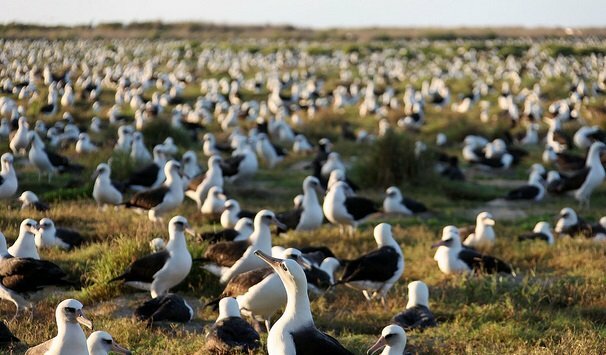 These remote islands, some more than 1,000 miles from Honolulu, are home to huge globally-significant colonies of Laysan and Black-footed Albatross, among many others. Many of these islands are part of the Hawaiian Islands National Wildlife Refuge and one of the most important areas is Midway Atoll National Wildlife Refuge. These islands and their surrounding waters are protected as part of the Papahanaumokuakea Marine National Monument. Invasive species, particularly rodents, have long been a problem on the Hawaiian archipelago. Midway, which was once a military facility, has long had mice and it once had rats, though they were eradicated in 1996. 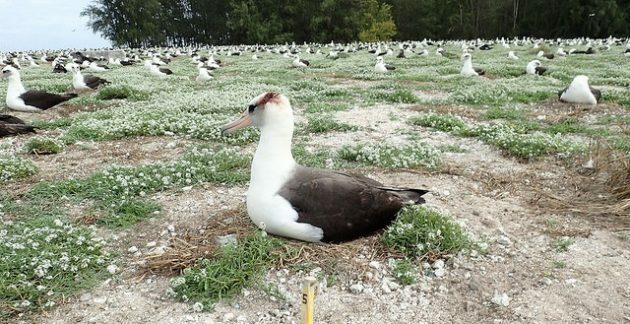 In 2015, mice suddenly started attacking albatrosses sitting on nests and attacks have been steadily increasing since. Having evolved without predators, the albatrosses are effectively defenseless against the mice and the photos show the consequences. Mice are also detrimental to the island’s habitat for other reasons, including their consumption of plants and invertebrates, often competing with native species. They are also disease vectors. As a result, the U.S. Fish and Wildlife Service (FWS) wants to eradicate all of the mice on Midway. How? By poisoning them. 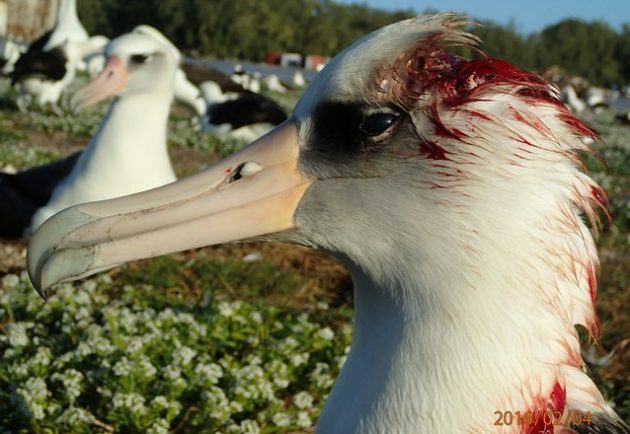 But FWS cannot just go out and spread poison on a critically important seabird nesting island. Before it does so, it must jump through a series of legal hoops. Perhaps most significantly, any federal project with a significant environmental impact must complete an environmental impact statement (EIS) pursuant to the National Environmental Policy Act (NEPA). Because Midway is home to endangered species (e.g., Laysan Duck, Hawaiian Monk Seal), FWS must also comply with the Endangered Species Act (ESA). Midway’s birds are also protected by the Migratory Bird Treaty Act. NEPA does not compel a specific result but instead forces an agency to take a hard look at any environmental consequences before it takes any action that may have a significant impact. A typical EIS will describe the proposed action and its purposes, and analyze the potential environmental consequences. It will also describe and analyze various alternatives. On March 21, 2018, FWS released a 198-page document entitled “Midway Seabird Protection Project — Draft Environmental Assessment.” There is also a website with additional information. The public had until April 20, 2018 to comment. The plan is to conduct the eradication in July or August 2019. The document consists of an executive summary, nine chapters, two appendices, and many tables and figures. The use of Brodifacoum-25D rodenticide with supplemental trapping. Multiple bait distribution methods – primarily aerial broadcast but also supplemental hand broadcast and bait stations. Three bait applications spaced roughly 7-10 days apart, projected to start in early July. Implementing mitigation measures identified for selected species. Implementing effectiveness monitoring to assure mitigation is carried out and determine if mitigation is producing the desired results. Employing long-term biosecurity protocols to prevent the reinvasion of the island by mice and rats. In other words, FWS plans to distribute rodenticide, in three separate waves, from helicopters, by hand, and at bait stations. They will monitor the program and take steps to prevent reinvasion. And they will implement mitigation measures for some species. The assessment walks through the potential impact of the preferred alternative as well as other alternatives, including a “no action” alternative, on habitat, animals, infrastructure, etc. Most bird species are discussed individually, with estimated risk and mitigation methods, if appropriate. For example, seabirds are unlikely to be impacted because they eat fish and other marine prey from the Pacific Ocean. Because they do not forage on land, they are highly unlikely to eat bait pellets. For higher risk species such as shorebirds and waterfowl, FWS plans to trap and hold until the risk period ends. The analysis assesses risk for each species, both direct and indirect. The document is long and dry but if one is interested in what sort of analysis is conducted before such an action, it is worth a few minutes to skim it. A final rule, including responses to public comments, will likely be issued in the coming months. Photos: Laysan Albatross 1, 2; Midway Atoll NWR by USFWS-Pacific Region. Good job. NZ pioneered this approach. It works.